It is Albert Einstein's (March 14, 1879 – April 18, 1955) birthday today. A German-born theoretical physicist who won the 1921 Nobel Prize in Physics, Einstein developed the general theory of relativity and was best known in popular culture for his mass–energy equivalence formula E = mc2. March 14, or 3/14 in the month/day date format, is also known as “Pi Day,” an annual celebration of the mathematical constant π (pi), due to its resemblance to the first three digits in the decimal expansion of π. Pi Day in 2015 is very special because the corresponding date 3/14/15 represents the first five digits of π (3.1415), which only comes once a century. In addition, at 9:26:53 a.m. and 9:26:53 p.m. the date and time of the moments represents the first 10 digits of π (3.141592653). English publisher and writer John Taylor (1781–1864) argued in his 1859 The Great Pyramid that the numbers Pi and the golden ratio may had been deliberately incorporated into the design of the Great Pyramid of Khufu at Giza. The original height of the Great Pyramid was 146.5 meters or 481 feet with a base of 230.4 meters or 756 feet in length. By dividing the perimeter (4 x base length) of the Pyramid by its height, one obtains 6.29 which is a close approximation to 2π. Since π is defined as the ratio of a circle’s circumference to its diameter, John Taylor suggested that the Great Pyramid was intended to be a representation of the spherical Earth, with the height corresponding to the radius from the center of the Earth to the North Pole and the perimeter corresponding to the Earth's circumference at the Equator. However, such significance has been discounted in recent years. 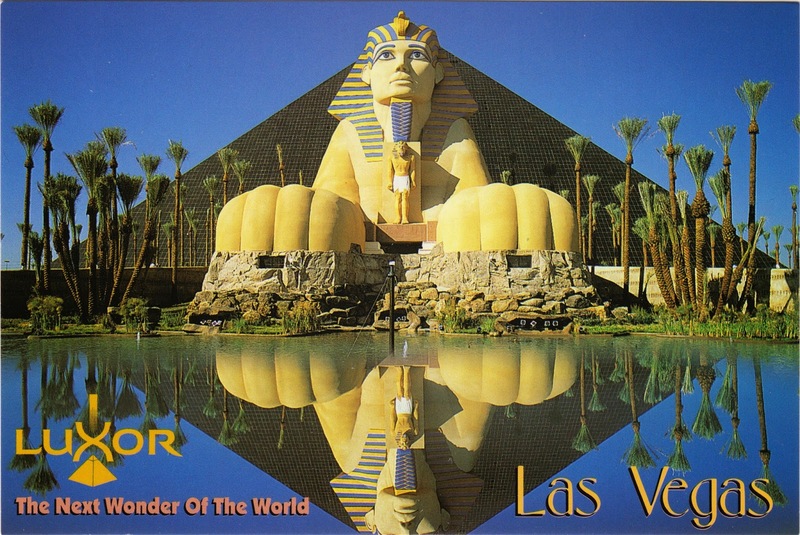 Postcard US-2543275 to India shows a replica of Great Sphinx of Giza and the pyramid-shaped tower of Luxor Las Vegas, a hotel and casino on the Las Vegas Strip in Paradise, Nevada that opened in 1993 and was named after the city of Luxor (ancient Thebes) in Egypt. The reflecting pool is gone now after renovation and a tram station is in its place.